Each of the three scenic passenger rail journeys in New Zealand are unique, with views from the Northern Explorer train showing you the diverse countryside of the North Island - towering viaducts, spectacular gorges, hidden valleys, to the rugged coastline of the South Island, seen from the Coastal Pacific train to the mountain alpine scenery from the Tranz Alpine train. Travel in air conditioned, centrally heated, carpeted carriages that have an advanced air bag suspension system for quieter and smoother travel, un-tinted, non-reflective, panoramic side and roof windows to capture the dramatic coastal and mountain views, GPS triggered journey commentary in two languages (English and Mandarin) at your seat via headphones, plus information displays, overhead HD video and onboard washroom facilities. Seating is comfortable '2 Seat-Aisle-2 Seat' reclining seats with head rests or 'Table Group' (4 people around a table) seating - great for families, small groups or meeting new friends. For mobility-impaired passengers, there are spaces for wheel chairs and a disabled public toilet. Wheelchair hoists provide access to the cafe carriage from track level. For hearing-impaired passengers - a hearing loop covers all of the cafe carriage saloon and serving area. All long distance passenger trains have a cafe carriage serving a range of snacks, light meals and non-alcoholic/alcoholic drinks and open air viewing carriage. Your friendly onboard train crew are there to provide assistance to make your travel a comfortable and enjoyable experience. With connecting scenic coach services, you can travel south from either Greymouth or Christchurch to the West Coast Glaciers, Queenstown, Milford Sound, Invercargill, Mt Cook/Aoraki, Invercargill (for ferry services to Stewart Island), Dunedin or from Auckland to Paihia in the Bay of Islands and the thermal wonderland of Rotorua. You can explore New Zealand with a Scenic Rail Pass which allows you unlimited travel on New Zealand's long distance passenger train network including ferry travel between Wellington in the North Island and Picton in the South Island, at you own pace, at any time, in any direction. You can choose your own route, stop when you like, and travel as many times as you wish within the validity of this flexible pass - hop on and hop off where and when you wish or choose from a range of suggested rail pass travel itineraries. 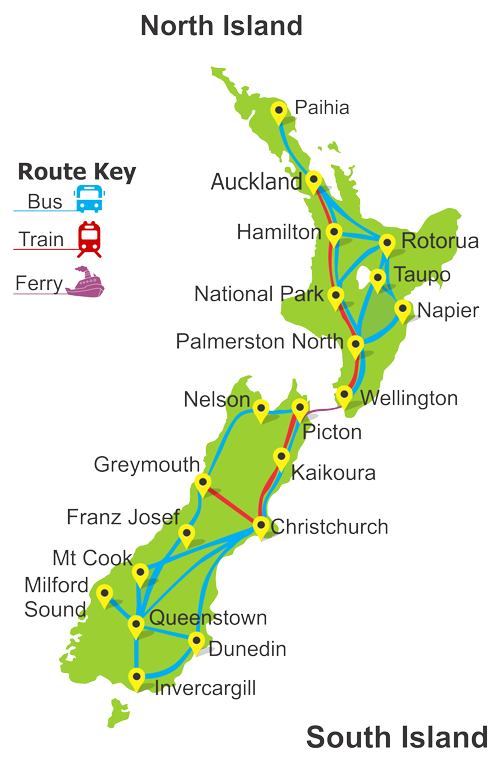 Alternatively, you can use a Scenic Train/Bus Pass, which allows you to travel on New Zealand's long distance national passenger rail and bus travel networks at you own pace, at any time, in any direction, including ferry travel between the North and South Islands between Wellington in the North Island and Picton in the South Island and travel on modern buses and coaches to other tourist destinations, like Queenstown, Milford Sound, Mt Cook, the beautiful Bay of Islands and the thermal region of Rotorua to name a few destinations plus travel on New Zealand's long distance passenger train services and selected sightseeing tours. Both Scenic Rail Passes and Scenic Train/Bus Passes are designed for the independent traveller whether its individuals, families or small groups who want to get the best out of their New Zealand holiday and experience the true beauty and benefits of train and bus travel and provides genuine savings off the standard adult fare - so the more you travel the better the value.